Last year’s ISC West was packed with thousands of industry professionals who converged on the Sands Expo and Convention Center in Las Vegas. With the largest show floor and most exhibits to date, the event continued to grow in size and variety. This year, we’re also expecting a host of innovative solutions, engaging workshops and presentations—all with the goal of helping you re-imagine security and create smarter business. Will you be at this year’s ISC West? If so, stop by our booth to discover how you can add new dimensions of insight and opportunity to uncover a whole new world of thinking when it comes to business optimization and safety. Need a free expo pass? Find them here. Not able to attend, but still want the latest updates about what we’ll be showing? Stay up to date with us on Twitter @Axis_NA. If you’d like to get an idea of what ISC West was like last year, read on! In this post, we highlight key happenings from the show and take you on a guided “tour” of our booth, which contained a variety of solutions that can help your business succeed. From left to right: Fredrik Nilsson, VP, Americas, Hakan Hansson, Product Manager Network Audio, and Martin Gren , Axis’ Co-Founder, host Security Industry Jeopardy at our 11th Annual Axis Press Breakfast. AXIS Q6125-LE Network Camera. This the perfect fit for city surveillance applications with its directionally discreet and compact dome design. Add in 1080p, sharp image quality, 30x optical zoom, a speed dry function and the included AXIS Guard Suite analytics, and you’re talking about one powerful camera. AXIS FA3105-L Sensor Unit. This is our first sensor unit with built-in IR illumination in the modular camera category. A compact eyeball sensor with Forensic WDR and 1080P resolution, you’re sure to get quality images 24/7. For a full list of our new IR-enabled products, check out this release. Additionally, we introduced a number of new products for small businesses, as well as wide and seamless panoramic surveillance and expanded connectivity and audio. AXIS T61 Audio & I/O Interface Series. This provides connectivity where it’s needed, enabling two-way audio and I/O connectivity together with compact, cost-efficient Axis cameras that do not already have the functionality built in. AXIS Audio Manager C7050 Server. This simplifies the configuration and management of larger, complex audio systems because of its pre-installed management software. When coupled with AXIS C Series products, it allows for central management of scheduling, zone management and audio content in larger areas, such as school campuses or stores. For more on these products, read this release. Staying ahead of the curve means providing innovative solutions that help improve security and enhance operational efficiencies. 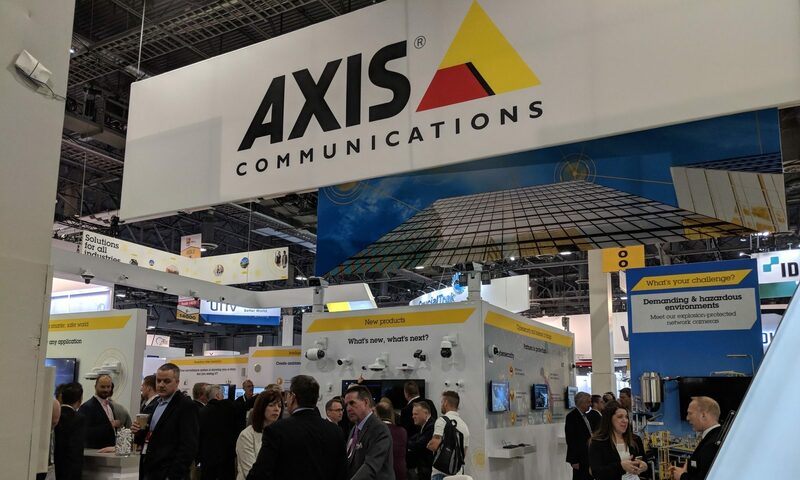 This year, the Axis booth covered a number of hot topics among security professionals and customers. As visitors walked in, they could easily find solution walls geared toward perimeter protection, cybersecurity, video analytics, small and medium business, intelligent solutions and more. Implementing and following proper cybersecurity protocols is now a vital part of any company’s standard operating procedure. Whether you’re just starting to think about how to secure your network devices or you’re ready to implement a complete strategy, we’ve got you covered! Watch our on-demand cybersecurity webinar series to learn more about how we can help you create and maintain a safe cybersecurity ecosystem. The main objective of perimeter protection is to detect a physical threat or intrusion as early as possible. That’s made easier with the aid of fully optimized, integrated IP security solutions, which work together and in real time to monitor everything from a facility’s outer perimeter to individual buildings. With the right solution in place, you can protect any site—even in remote, unmanned locations—reduce false alarms and ultimately improve on-the-spot decision making. Learn more about how to detect security breaches from perimeter to core with this perimeter protection infographic. Over the past two decades, the security industry has transitioned from closed-analog, closed-circuit, proprietary systems to digital, open, IP-based network solutions. And with that, standard video solutions can now take advantage of the latest in intelligent video analytics to improve safety, efficiency and profitability. At ISC West we showcased how intelligent technology allows retailers to better optimize their store’s layout and appearance for a more personalized in-store, shopping experience—an approach the majority of customers appreciate, according to research. And we’ve also explored how video analytics can help improve stadium operational efficiencies, as well as how analytics can be used to reduce energy consumption. Correctly installing solutions the first time around can save you time, money and resources. After all, who wants to uninstall and replace hardware once it’s already setup? The ability to get it right the first time starts with taking advantage of the proper end-to-end tools. Check out our entire suite to discover how you can efficiently design, install and maintain. You have enough to think about when running your business. Reduce stress with budget-friendly video surveillance security solutions specifically designed for small businesses like yours. Take the newly released Axis Companion minis, for example. These cameras are small, compact and attractively priced, and they have the same high-quality as enterprise products. Whether on-site or on-the-go, you can easily monitor your facility, allowing you to devote more time and effort into building your business. Learn how you can simplify your video surveillance with an AXIS Companion solution. 6. Intelligent audio: Create ambiance. Communicate alerts. Like the video surveillance industry was years ago, the audio world today is largely dominated by analog technologies. At Axis, we see audio differently, and we understand that with networked solutions you receive a better, more intelligent audio offering. Along with introducing new products, we were honored to take home several awards and be part of a number of speaking engagements and panel discussions. Secure Campus 2018 Award: The 2N SIP Mic won a platinum award for the “Communication Devices” category. Security Today Government Security “Govies” Award: The AXIS Q8742-LE Bispectral PTZ Network Camera won a platinum award in the “Video Surveillance Advanced Imaging Technologies” category. Security Sales & Integration (SS&I) Most Valuable Product (MVP) Award: The AXIS T6101 Audio and I/O Interface won in the “Miscellaneous Security Products” category. SIA’s New Product Showcase Award: The SIA New Product Showcase received 122 entries this year. The AXIS D2050-VE Network Radar Detector won for the category of “Intrusion Detection and Prevention Solutions” and AXIS Device Manager for the category of “Tools and Hardware.” The AXIS P1280-E Thermal Network Camera was given an honorable mention in the category of “Video Surveillance Advanced Imaging Technologies.” This is the fifth consecutive year we’ve earned an NPS award at ISC West! 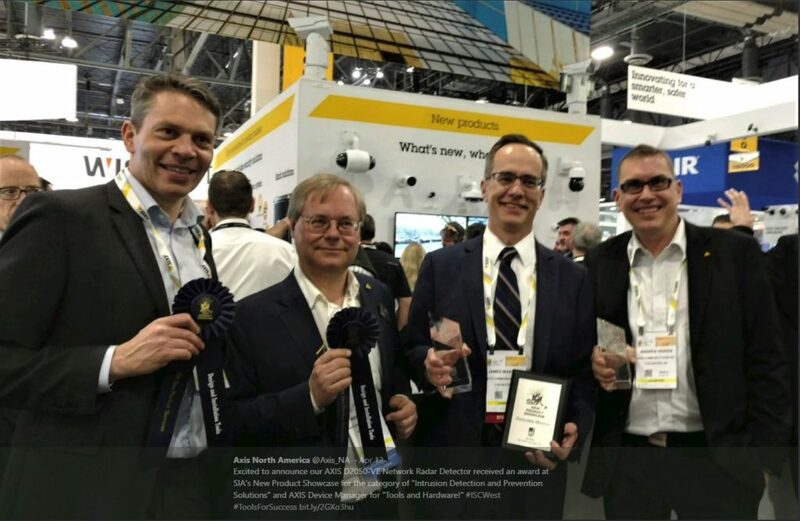 From left to right: Fredrik Nilsson, VP, Americas, Martin Gren, Axis’ co-founder, James Marcella, Director of Industry Associations, and Andres Vigren, Global Product Manager, accept SIA New Product Showcase awards at ISC West. Outside our booth, Axians branched out all over the convention center to take part in speaking engagements ranging from IoT in physical security to data protection and cybersecurity. The Security 5K featured 91 Axians! Thank you to all who joined. 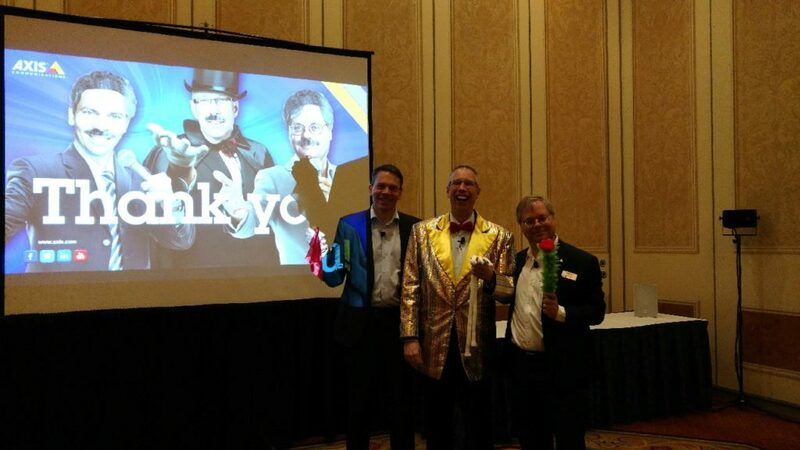 Of course, ISC West wasn’t all business! We were happy to put aside the formalwear in favor of shorts and t-shirts for The Security 5K, an annual race where all proceeds are donated to Mission 500, a nonprofit organization that works in-tangent with the security industry to provide aid to US children and families living in poverty. In total, we’re proud to announce that 91 Axians registered for our team. If this was a game of Jeopardy, and the question was: “After 72 hours at ISC West, the main takeaways are these,” what would your answer be? Maybe it’s: “What is, they differ for everyone,” Mr. Trebek (or in this case, Martin Gren, Fredrik Nilsson and Hakan Hansson). While a bit cheesy, we’d agree, and I think you get our point. As with previous events, this year’s ISC West was the perfect opportunity to make deeper and new connections, as well as celebrate new milestones (congrats ONVIF for celebrating your 10-year anniversary. We’re proud to have been a founding member!). Furthermore, it not only gave us the chance to showcase our solutions (and new products) but also gain greater insight into the security challenges that customers face today—and there are many. With a greater understanding of these obstacles, as well as the emerging and growing trends in AI and cybersecurity, we can continue to drive innovation in technology and solutions to create a safer, smarter world. 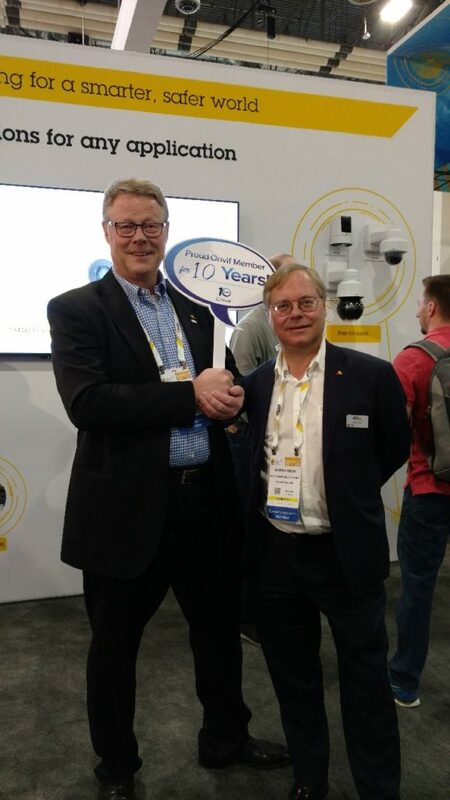 From left to right: Per BJorkdahl, Director, Business Development and Martin Gren, Axis’ co-founder, celebrate ONVIF’s 10-year anniversary.